The following is a summary of a presentation to PLAN-Boulder County on November 12th, 2012. To view the accompanying slides, click here. “All ethics so far evolved rest upon a single premise that the individual is a member of a community of interdependent parts… The land ethic simply enlarges the boundaries of the community to include soils, waters, plants, and animals, or collectively: the land. 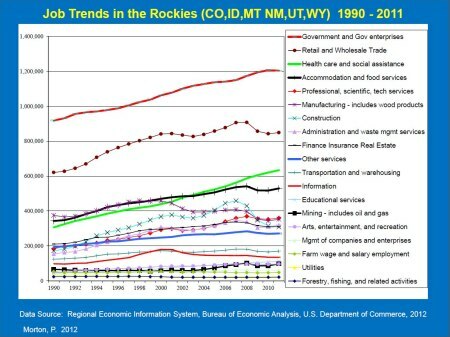 High quality outdoor recreation, open space and scenic vistas, clean air, clean water, abundant wildlife and biodiversity are representative of the “natural amenities” that have been major drivers of economic development in the Rockies over the last 30 years. While the economic role of natural amenities varies across the “new western” landscape, in many communities like Boulder protecting the environment is a prerequisite for sustainable economic success. Natural amenities, when combined with community amenities, can attract a highly skilled labor force, small businesses and entrepreneurs, recreation and tourism-based businesses, and retirees who bring their accumulated wealth. 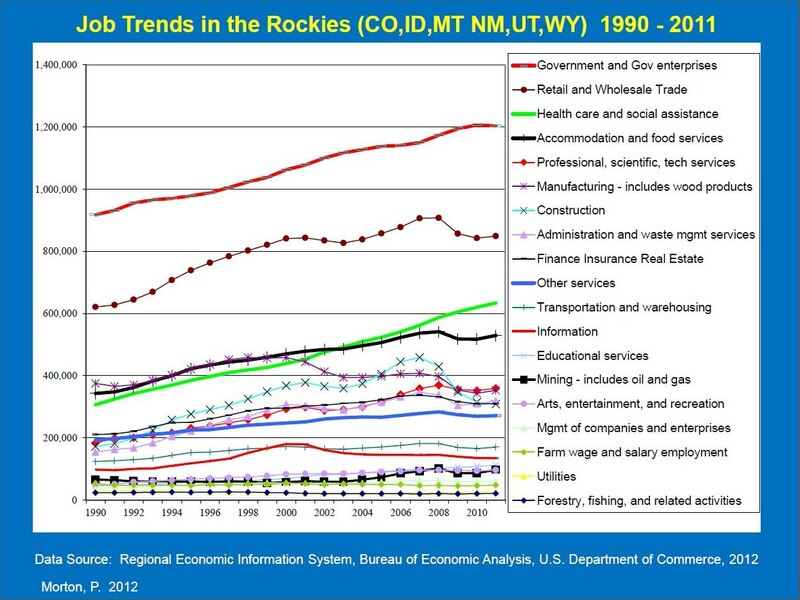 Job trends for the Rockies are shown in the figure below. 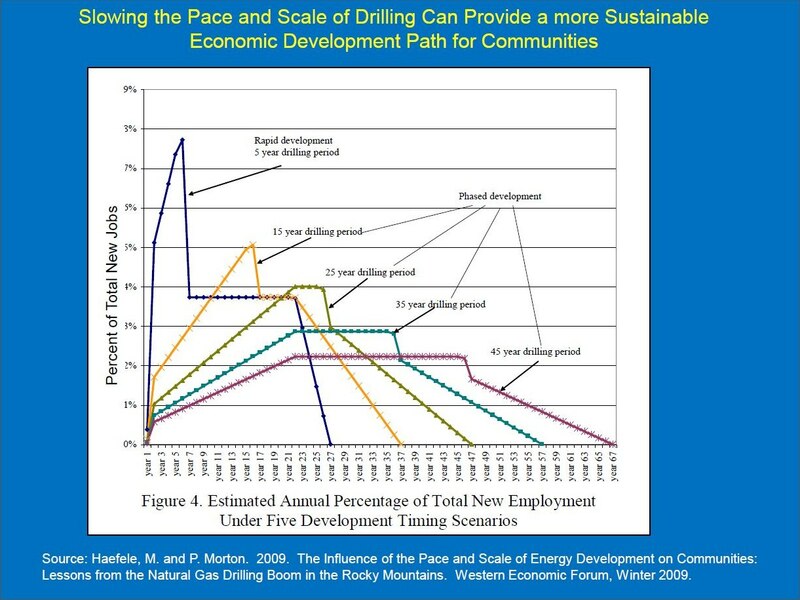 While oil and natural gas development does generate economic benefits, as the pace and scale of drilling increases so do the cumulative risks. While Colorado has some of the strongest laws in the US—many residents and local elected officials do not believe they go far enough—as evidenced by the intra-jurisdictional legal battles currently brewing. One strategy for moving forward is to implement phased energy development guided by the precautionary principle and backed by a suite of economic instruments. 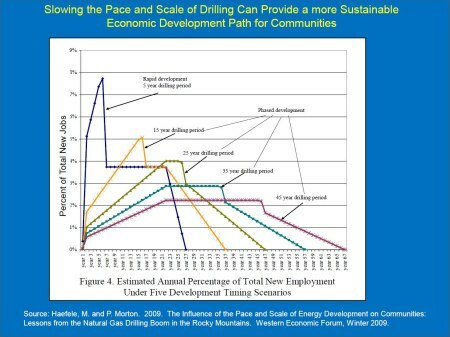 Under a phased development strategy, the pace and scale of drilling is regulated in order to manage our exposure to harm. The precautionary principle implies a social responsibility to do no harm and to protect the public health by requiring full disclosure, baseline data collection, monitoring, inspections, enforcement, and financial assurance. The precautionary principle redistributes risk by requiring drilling decisions to be based on good data which prove no harm—placing the burden of proof on the oil and natural gas industry rather than requiring county residents to prove harm. One of the goals of responsible energy development should be to control and internalize into drilling decisions the hidden costs (negative externalities) to communities, to human health, to biodiversity, to our climate, and to our natural amenities. Consumers can more fully express their preferences and markets will operate more efficiently when all costs—public and private—are included in our energy supply curve.